The Shore Promenade is located in Bay Ridge, which is the southernmost part of Brooklyn and it spans all the way to Bensonhurst. 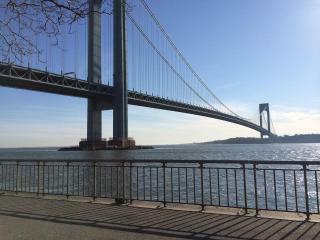 You can run 4.5 miles alongside the Belt Parkway and enjoy stunning views of the sunset and Verrazano Bridge. The promenade is divided into two sides; one side is for bikers and the other is for pedestrians who want to walk or run. It offers spots to picnic and fish. You can enjoy a day with friends and family in the sun or under the bridge. The Shore promenade has a great atmosphere where you can take a break from your run and smell the ocean.